Bikes on buses have reached the Capital Region! Although there is no information on the Capital Area Transit website, a trip to Harrisburg yesterday confirmed that most if not all CAT buses now have bike racks. 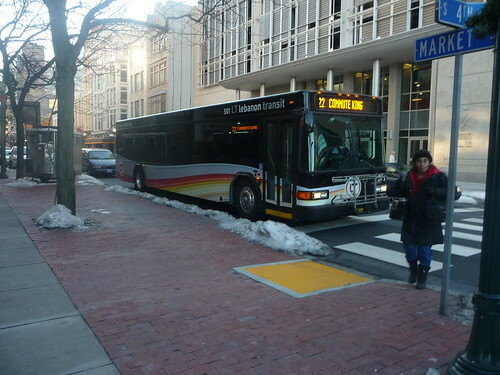 Other commuter bus services that serve Harrisburg such as Rabbit Transit (York County) and Lebanon Transit also have bike racks on their buses. Alas, you can only take a folding bike on Amtrak to Harrisburg. Lebanon Transit Express Bus with a bike rack, these high tech commuter buses also have Wifi and reclining seats. Ahhhh! I can confirm that there are bike racks on all of the CAT buses! It would be nice if CAT posted something about this on their site. People probably don't know how they work (I don't).